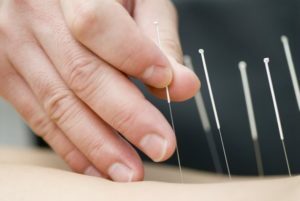 Dry needling is an effective therapy to treat the muscular tension and spasms which often accompany back and neck pain, herniated discs and muscular and ligamentous strains. When an injury occurs from a repetitive use or sporting trauma, the injured site will become inflamed. The surrounding musculature goes into contracture as they protect against possible instability, damage or dysfunction. The contracture combined with localised inflammation inhibits microcirculation which limits both oxygen rich blood reaching the injury and waste products leaving. The site of injury becomes hypoxic (decreased in oxygen) which stimulates the body to produce fibroblasts, a cell that produces scar tissue. The scar tissue builds up in and around the site of injury, therefore causing restriction, dysfunction and pain. Nerves can also be irritated and compressed by the scar tissue. Trigger point dry needling uses a small, solid, filament needle which is inserted in a contracted painful knotted muscle. This creates a local twitch reflex which is both diagnostic and therapeutic as this is the first step in breaking the pain cycle. The primary healthcare practitioner uses manual therapies such as manipulation of the spine and extremity joints, soft tissue work, acupuncture, stretching and strengthening exercises, rehabilitation and postural and lifestyle advice. © 2018 Andy Davies Chiropractor Cardiff | All rights reserved.